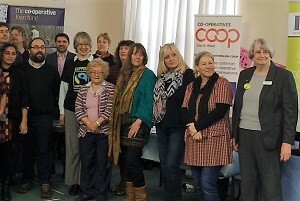 Splitz' Devon service was invited to attend an awareness raising event at the mosque in Exeter on the 8th March for International Women's Day and Fair Trade Fortnight. The Independent Domestic Violence Advocates (IDVA) attending met many people at their stand, which formed part of the exhibition. Following the success of the Talk Toolkit for teenagers, Devon’s Safeguarding Team, led by Team Leader Emma Stephens, has developed a new toolkit for primary aged children. The toolkit, which has been developed in consultation with seven local schools, will provide professionals working with primary age children with a resource to help them support those who have been affected by domestic abuse. Splitz Devon Domestic Abuse Support Service (DDASS) has gained recognition for the quality of its management and service delivery to victims of domestic abuse, after being awarded the nationally recognised Leading Light accreditation. As part of Hate Crime Awareness Week CPS nationally has launched a public consultation and is asking for community views to help shape future policy to improve the response to racially and religiously aggravated hate crime. Devon Domestic Abuse Support Service (DDASS) is delighted that Exeter Council has chosen to support our Young People Safeguarding Team in their work around creating ‘Safe and Sound’ - a toolkit for primary age children who experience the impact of domestic abuse. Our grateful thanks to Amesbury Town Council for their support of our Buddy project. At the recent grant allocation meeting, Splitz was awarded £300 to continue its nationally accredited mentoring & befriending work, supporting women and children from the Amesbury area who have experienced the trauma of domestic abuse. The Buddy project provides the essential longer term emotional support which prevents isolation, loneliness, and helps rebuild the self confidence and self esteem of those who have suffered so much. Our grateful thanks to Melksham Town Council for their continued support of our Buddy project. At the recent grant allocation meeting, Splitz was awarded £400 to continue its nationally accredited mentoring & befriending work, supporting women and children from the Melksham area who have experienced the trauma of domestic abuse. The Buddy project provides the essential longer term emotional support which prevents isolation, loneliness, and helps rebuild the self confidence and self esteem of those who have suffered so much.